Active Travel is offering up to $1000 off international flights to travellers who book one of eight expedition voyages to the Arctic in 2015. The offer is valid for bookings made before September 30, 2014, with travellers who book an Arctic voyage from Scandinavia receiving A$500 each off their international flights booked through Active Travel and those who book an Arctic Greenland and Canada voyage receiving A$1000 each off their flights from Australia. The eight voyages, from 10-13 days, will take adventurers deep into the high Arctic during the northern summer months of June to August when the sun shines up to 24 hours a day. All eight voyages take passengers to remote islands in the Arctic Ocean, which are covered in snow and ice for much of the year but burst to life with colourful wildflowers in the brief summer months. Wildlife, including polar bears, foxes, walruses, seals and beluga whales, are active and visible. All voyages include guided excursions ashore by zodiac inflatable boats to visit isolated communities and spot wildlife. Onboard lecturers also recount tales of heroic exploration by early Arctic pioneers. Of special interest is Active Travel's 'Spitsbergen Off the Beaten Track' itinerary. This cruise begins in the frosty town of Longyearbyen on the remote Norwegian island of Spitsbergen which lies within the Arctic Circle half way between the tip of Norway and the North Pole. The Russian polar expedition ship, Akademik Sergey Vavilov, cruises over ten days through ice-filled waters along the island's coast. Along the way, zodiac trips take passengers to see glaciers and fjords up close and passengers will visit the tiny research settlement of Ny Alesund, which boasts a summer population of 120 and summer highs of five degrees centigrade. With 24 hours of daylight between April to August and lying at 79 degrees north, Ny Alesund is the northern-most community in the world, just 1200km from the North Pole. The Spitsbergen Off the Beaten Track voyage is available from US$6695 per person, twin-share, including zodiac excursions, onboard lectures, all onboard meals and use of Arctic weather gear. Flights to Spitsbergen are not included and can be booked through Active Travel, with a A$500 per person air credit available for cruise bookings made before September 30, 2014. Also on offer are the optional extras of sea kayaking among the icebergs and the experience of snow shoeing. A discount of A$1000 off return flights to Canada are available for bookings made before September 30, 2014, for the 12-Day 'Baffin Island and West Greenland – Off the Beaten Track' voyage. This round-trip voyage sails from the Baffin Island town of Iqaluit in Canada on July 22, 2015. The cruise aboard the Russian scientific ship, Akademik Ioffe, explores the mighty glaciers, deep fjords and indigenous communities of the eastern Canadian Arctic and the west coast of Greenland. Wildlife is abundant with possible sightings of polar bears and the woolly Arctic mammal, the musk ox. Sea kayaking is also available as an optional activity. The 'Baffin Island and West Greenland – Off the Beaten Track' cruise is priced from US$8995, per person, twin-share, ex Iqaluit, including Zodiac excursions, onboard lectures, all onboard meals and use of Arctic weather gear. Flights to Baffin Island are not included and can be booked through Active Travel. 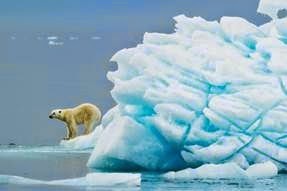 For details of all eight Arctic packages, visit www.activetravel.com.au or call 1300 783 188.